LOS ANGELES, November 15, 2017 /3BL Media/ - In celebration of National Philanthropy Day, AEG, the world’s leading sports and live entertainment company, announced its plans for its annual Season of Giving, the company’s initiative that encourages its employees throughout the world to engage in charitable activities in their local communities to HOPE. ACT. GIVE. During the initiative throughout November and December, AEG focuses its philanthropic efforts to raise funds and generate awareness for nonprofit organizations working on substantive issues related to hunger, homelessness, healthcare and education. Throughout Season of Giving, AEG encourages its employees to participate in multiple service days throughout their communities, collectively spending thousands of hours volunteering and making a positive impact at local schools, homeless shelters and community organizations. In Southern California, participating venues and AEG-owned companies include STAPLES Center, StubHub Center, Microsoft Theater, L.A. LIVE, The Shrine Auditorium, The Fonda Theater, The Novo by Microsoft, LA Kings and LA Galaxy among other divisions. “AEG’s Season of Giving not only spotlights the efforts of nonprofit organizations but brings together our employees and community partners to work side-by-side with the collective goal of improving their respective communities,” said Martha Saucedo, Executive Vice President, External Affairs, AEG. 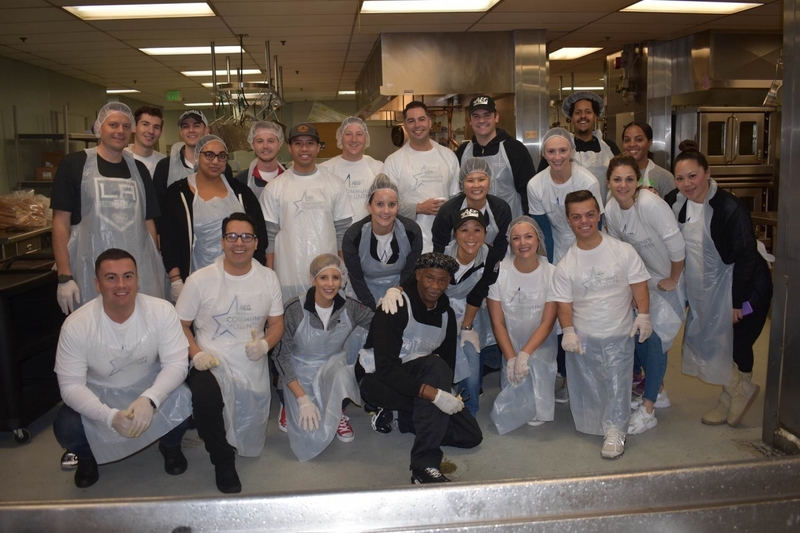 Officially kicking off this year’s Season of Giving, more than 20 AEG employees from STAPLES Center’s premium sales department served breakfast this morning at Union Rescue Mission in downtown Los Angeles. Union Rescue Mission is one of the largest missions of its kind in America — bringing help and hope to men, women, and children experiencing homelessness in downtown Los Angeles. Saturday, Nov. 18, as a major sponsor, AEG will join thousands of Angelenos for the 11th annual HomeWalk, United Way of Greater Los Angeles’ annual 5K family run/walk to end homelessness in L.A. County. Throughout the past 10 years, more than 85,000 walkers have raised more than $7.6 million to support the homeless population in Los Angeles. Tuesday, Nov. 21, AEG employees will prepare and serve breakfast at The Midnight Mission, a homeless shelter in Skid Row. The Midnight Mission offers a path to self-sufficiency to men, women and children who have lost everything. The homeless shelter offers emergency services, a 12-step recovery program, job training, education and work programs that lead to productive lives. On Thanksgiving Day, L.A. LIVE’s The Novo by Microsoft will host more than 1,200 local residents for a Thanksgiving Day meal prepared by Wolfgang Puck Catering. Participating nonprofit organizations include Hope Street Family Center, Salvation Army Red Shield, Central City Neighborhood Partners, Ketchum Downtown YMCA, Olympic Primary Center, All People’s Community Center, 10th Street Elementary, and U.S. Vets. In addition to the non-profits that will be participating in this Thanksgiving Day meal, will be more than 400 veterans from U.S. Vets. On Friday, Dec. 8, more than 300 AEG employees will spend the day volunteering in the local community for AEG Service Day, an initiative that encourages all Southern California AEG employees to spend a day volunteering in the community as a team. AEG employees will spend the day at Nevin Avenue Elementary School in Los Angeles for a powerful day of service to make the high-needs school a more engaging, educational and colorful place for children to learn and play. Service projects to include painting murals and other beautification work. To celebrate the 4th and 5th grade students with perfect attendance at AEG’s local adopted school – Tenth Street Elementary – AEG will host a Holiday Party at L.A. LIVE’s Lucky Strike Lanes on Tuesday, Dec. 12. The holiday party will feature bowling, food, photo booths, gift giveaways and holiday activities for the participating students. Rounding out its Season of Giving, AEG will host a Community Holiday Party for more than 500 community members from local nonprofit organizations on Tuesday, Dec. 19 at the Los Angeles Convention Center. In addition to enjoying a delicious meal catered by Levy Restaurants, guests will enjoy games, crafts and free ice skating at the LA Kings Holiday Ice at L.A. LIVE.